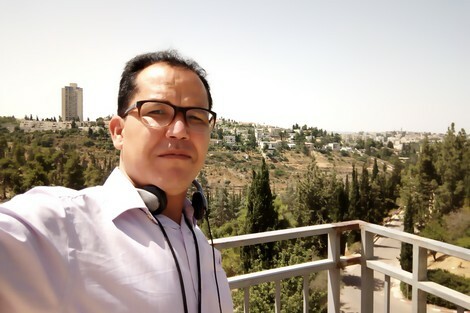 Major Moroccan newspaper Hespress published a scathing op-ed by a man who is visiting Israel, ripping his critics who are against this kind of "normalization." Mimoune Oumelaid is no fan of Israel. But he points out, "To visit Israel does not mean that you agree with its crimes, or that you are hostile to the Palestinians or against their legitimate struggle. Otherwise, all those who participated in the World Cup in Russia agree with what they are doing in Syria. " I hope that I will be able to visit Jerusalem and pray in the place where my Moroccan ancestors prayed, on their way to the pilgrimage or during the return. They even had a door in their name in this place [Mughrabi Gate on the Temple Mount.] And to pray to God Almighty that everyone enjoy security and a decent life regardless of their different beliefs .. I have recalled a memory in my high school days. I remembered the enthusiastic plays I had written and played the role of a hero, either as a liberator of Palestine from the bond of the Jews, or calling for the opening of the frontier for young people to liberate Jerusalem. My plays often end with the defeat of the Zionists, the victory of the Muslims and the liberation of Palestine. .
One day, the enthusiasm of my teachers' sermons in my small brain was very large in one of the prsentations. The loud applause, the glances of the admiring girls refreshed my enthusiasm, I went off-script a little...In my enthusiasm I threw the microphone in a hysteria, shouting that Holy Jerusalem needs us now. The man grabbed my ear and shouted: "So you want to liberate Jerusalem by breaking my microphone?" I remember those passionate poems that I used to recite outside the synagogues, because we are all in contact with the Jews and the Zionists, and I do not differentiate between them like others. I remember my laughter from saying "Khaybar Khaybar, Jews .. The Army of Muhammad will return." I am now going to visit this brutal entity which I have repeatedly cursed in poems I memorized and even wrote myself. What has changed? How much has the Israeli Foreign Ministry given me to change my position and come to this country? Did the Mossad pump billions of dollars into my bank account? It is the right of the Palestinians to defend their land and the estate of their country. But we, who are far from the center of the conflict, have the right to visit them together. We raise our voices and pray to find a solution. We have no benefit other than words that do not guarantee or enrich. My solidarity does not benefit them in anything, nor does my visit to Israel hurt them in anything.